One of the most common uses for fishbone stitch is to fill leaf shapes, as the stitch creates a "vein" down the center as you work. There are two versions of this stitch, one which is flat and the other raised. 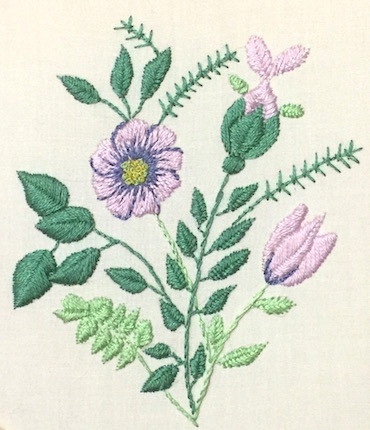 I used raised fishbone stitch for the leaves and righthand flowers in the photographed design. Using two strands of floss gives a smooth, shiny effect, but if you want a quicker result you can use crewel wool for this stitch. The design I stitched above came from J. Marsha Michler's book Motifs for Crazy Quilting. It is just an outline drawing, leaving you to make your choice of stitches and colors. To get started, thread your needle with a fairly long length of thread, as it can use more than you first expect. 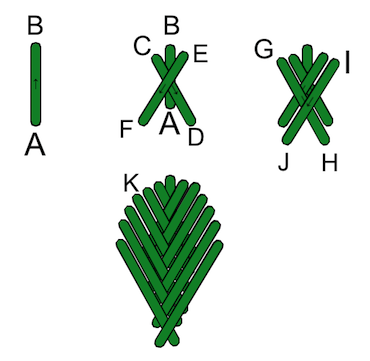 Bring your needle to the front in the middle of the leaf (A), and work a straight stitch up to the tip (B). Bring your needle up at point C on the diagram, which is just below, and to the left, of point B. Take it down close to the center, on the right hand side (D). Come back up at point E, to the right of the central straight stitch and level with point C. Go down at point F, just to the left of the center. Come back up at point G, to the left and a little lower than point C. Go down at point H, jbelow point D.
Continue to follow the outside shape, working stitches on alternate sides until the shape is filled. You can either place the stitches close to each other or spaced out a little, for different effects. Try to keep the stitches that go down in the center lined up as best you can. This results in a nice smooth vein line. If you leave a small gap between your stitches you will achieve an open fishbone leaf, as in fig 3, with a plaited effect down the center. You can also see an example of this on my filling stitches page. What is the difference between the two stitches? So what is the difference between the two forms of fishbone stitch? 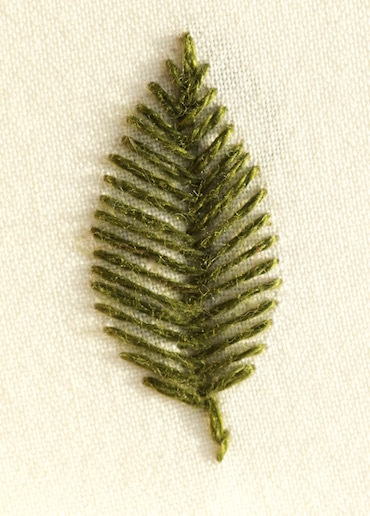 For the basic version each stitch is taken through the fabric close to the center of the leaf. When working raised fishbone you take the stitch across the whole width of the shape each time, forming a double layer of stitches which creates a more padded effect. You can see the depth this gives in fig 4, as the leaf is causing a shadow on the fabric. A flatter leaf would not do this. I have split the stitch diagram (fig 5) in to 3 stages to make it easier to see what is happening. 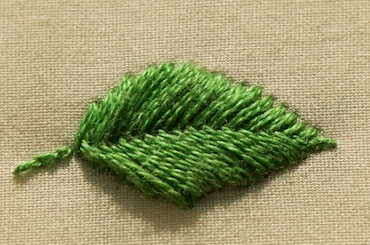 Start with a vertical stitch, which is around 1/3rd to 1/2 the length of the leaf. The bring the needle out to the right of point 2, at point 3. Take the needle back to the top and down through the fabric right next to point 1, and up at 5. This forms a short horizontal stitch on the back of the work. Take the needle back down at 6, on the same invisible line as point 3. This time taking a horizontal stitch on the back between points 6 and 7 bring the needle back to the front of the work. 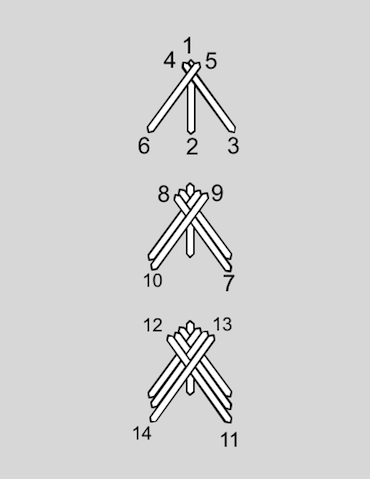 Take the thread across the worked area and insert the needle at point 8. Bring it back up at point 9, again forming a horizontal stitch on the back. Continue in this manner, forming diagonal stitches on the front and horizontal stitches on the back, to fill the area. You could use both variations of this stitch in the same design, to create more interest in the leaves. I do hope you will give one or both variations a try.